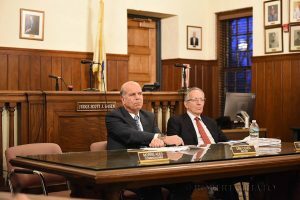 The issue arose after Deal passed an ordinance in 2017 designating the area between Neptune Avenue and Marine Place a public beach and set daily beach badge fees at $8 on weekdays and $10 on weekends. However, about a half-dozen homeowners with private beach access were excluded from paying the fees, a fact that came to light during a Dec. 4 meeting of the Deal Commissioners. Chambarry wrote a letter to the state Department of Environmental Protection last week asking for an investigation into Deal’s beachfront practices. The Chapter is proud to have won a small victory in the larger battle for fair and equal beach access in New Jersey.